The SXi/SXe range is available with 5 hopper options, providing a range of capacities from 1,580 to 3,650 litres. EASYtronic manages your Centerliner, monitoring forward speed and operating parameters such as disc speed and shutter position to deliver the desired application rate. Well considered design ensures ease of use at every stage from setting up to washing down, so that Centerliner owners come back time after time. Durable finish – Double powder coated with stainless steel spreading components. The Calibration Bowl is available to verify the recommended spread rate settings. A Centraside deflector can be fitted for precision border spreading from a tramline 2m from field margin. The sharp spread pattern cutoff is DLG approved and is ideal where watercourses are located on the boundary. Only recommended for SXe and SXi models. Connect to existing tractor or implement ISOBUS hardware or select EASYtronic+ CCI 200 terminal (illustrated). Straightforward touch screen controller, compatible with established GPS systems/ISOBUS for DPAE and mapping applications. GPS - either from a proprietary GPS guidance system in the tractor cab, or from a GPS speed sensor on-board the spreader. 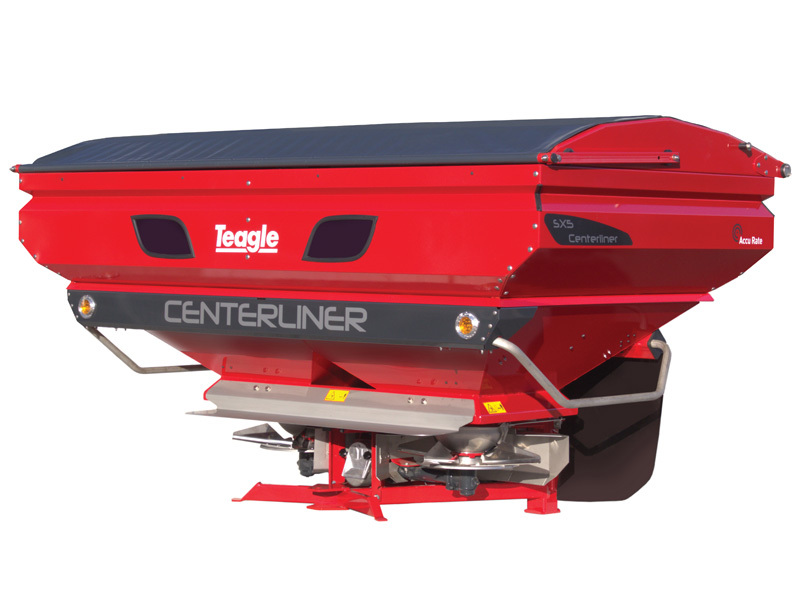 The on-board system is ideal when moving the spreader between tractors. A weigh frame is integrated to the three point linkage, using two weigh cells that sample machine weight every 100 milliseconds. A gyroscope is used to compensate for machine angle on hillsides. Can be fitted to the tractor wheel to provide speed input to the EASYtronic system. This option provides an alternative to the tractor radar link or GPS speed sensor options.